Casual elegance in a three level Victorian designer home located close to downtown in the upscale Rosedale neighbourhood. The house retains much of it's original period detailing, but has been decorated in a light and airy style. Walking through an archway up the cobbled path the house is set back from the street . The exterior retains much of its Victorian detailing including the original stained glass windows. You enter in to a small vestibule with french door and then straight in to the large open concept living dining area. The room is decorated in a casual but elegant style in neural tones of white and ivory with gilt accents. The room is filled with antique treasures acquired on my many buying trips to Europe. There is a small original Victorian working fireplace. The separate kitchen area has basic cabinetry and appliances but is filled with character and charm with its exposed brick wall and antique wooden island. The room is bright and sunny with sliding doors to a small deck with dining area for two. Off of the deck there is a private enclosed garden planted with flowers and overgrown with ancient wisteria , trumpet and grape vines.There is a sunny sitting area and a shaded dining area for six. There is a weber bbq. The painted original staircase leads to the second floor. The front bedroom has a large stained glass window and is the largest of the three on this floor. It has a queen size bed and is decorated in neutral grey tones. The pretty middle bedroom also has a queen bed and is decorated in pale blue and mauve florals. The rear bedroom overlooks the garden and is decorated in green tones of moss and chartreuse. It features an antique Directoire period single daybed. The main bath room on this floor has a marble counter with two sings and a full bath. Up an open staircase is the master bedroom taking up the full top floor of the house with sloping ceilings and a seating bay overlooking the main street. It has a ensuite bathroom with shower and a sunny roof deck with seating area.There is a daybed in the widow bay that can accommodate a child for sleeping close by. There is a curtain at the bottom of the stairs for privacy. Note:selected drawers and wardrobes in this room will be locked but there is plenty of storage space. Note that although the house has central air conditioning, the bedroom on the top floor remains quite warm in the summer months. There is a ceiling fan and a cross breeze off off the back deck. I am an interior designer and I own a home decor and lifestyle shop in Toronto. I travel frequently to England buying beautiful things for the shop and for my home. My style is a combination of casual and time worn mixed with elegant French antiques and modern accents. Just a 5 minute walk to Rosedale Subway station. 15 minute walk ti Yorkville with all of its shops and restarans and just steps further to Bloor St shopping with its designer boutiques. We really enjoyed Linda’s Victorian home. She was very accommodating and friendly. Was in the best neighborhood in Toronto! Endless choices for restaurants and bars. Really loved the quirkiness of Figures. The food there was amazing!!! Also loved Joso’s. The ambiance....fun & provocative with great service. Overall, our experience was top notch. I had a wonderful stay at Linda's beautiful home. Her home is very well located on a tree lined street in the Annex. I used her home for a business trip. I could travel easily and quickly to and from downtown. Cabs were abundant and convenient. Linda's home is beautifully decorated and has lovely spaces inside and outside. I would certainly consider returning with my family. There is a lot of room. Bedrooms and bathrooms are plentiful. Thank you Linda. I would highly recommend your home to both business and recreational visitors to Toronto. This was perfect for our weekend in Toronto. The location couldn’t have been more convenient, and Linda was very helpful and accommodating! The pictures are very accurate, and if it’s possible, the house is even better in person. We will definitely stay again when we are back in town! Great place, fantastic owners who are very kind! 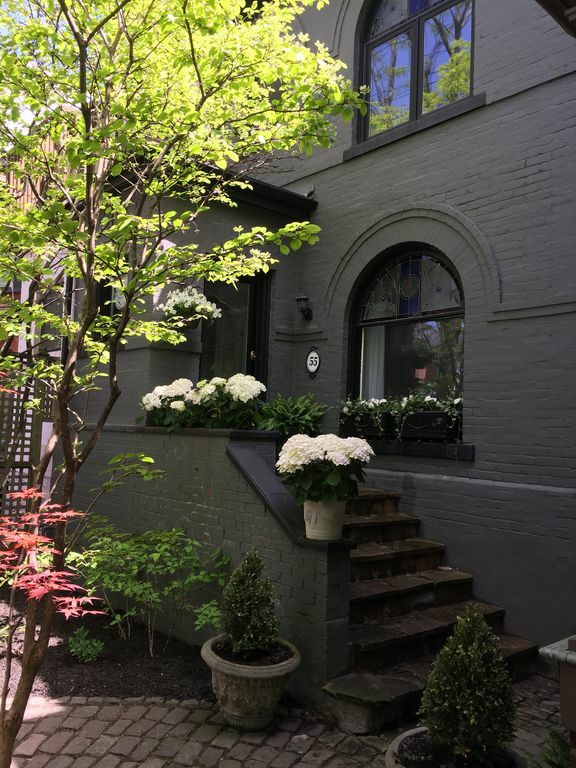 We stayed in this charming Victorian home for our daughter’s wedding weekend in Toronto. It was a beautiful home for the bride to get ready in for her big day. Our pictures were fantastic! The house is conveniently located and was beautifully decorated both inside and out. We were so happy with our choice as we don’t know Toronto well. It was everything and more that we wanted and needed for this special weekend. I had a wonderful stay at Linda’s home. The house is absoloutly beautiful and in an excellent location. Linda was very kind to let me host a party of 8 friends. Thank you Linda !! Cancelation Policy: Your reservation may be canceled up to two weeks before your arrival for a full refund of any payments made.